One copy of Chinese edition of book co-authored by Purba and Shah. 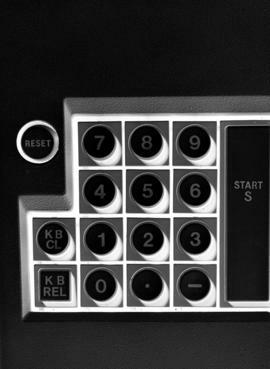 Photographs of the keyboard of an early adding machine. This file contains instructions on how to access DOBIS from off-site locations , Ryerson's electronic card catalogue was DOBIS. Item features a promotional image of a gold compact disc in front of a sparkling purple background. Item is an image of a man sitting at a computer looking at the monitor. Location: EK Image Centre. File consists of slides of the official opening of the York Ryerson Computing Centre. April 10th 1974. Item is a typescript manual for the Road Runner, a multi-event controller designed by Audio-Visual Laboratories (AVL) to connect and control multiple slide projectors. Colour composites for Computer Business Information Systems graduates. In 2000 the program changed its name, losing the "Computer" designation in its title and became "Business Information Systems".